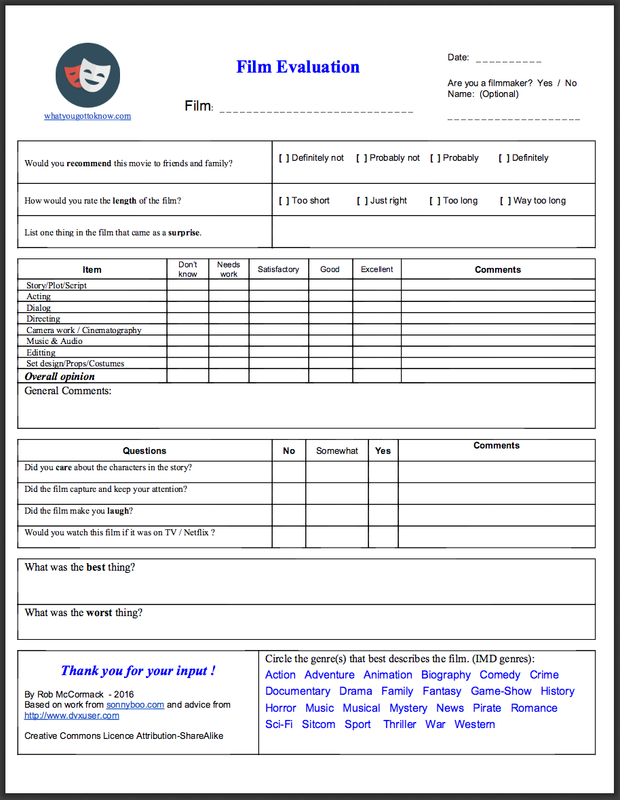 We created this free evaluation form because we could not find a good film evaluation form on the internet that could be easily customized and meet the needs of most filmmakers. It’s licensed under Creative Commons, meaning you can customize and distribute it freely. You should use any evaluation tool as a guide only. You’ll never please all of the people, all the time anyways – you certainly shouldn’t even try. Don’t be surprised if some evaluations are excellent and some are poor. 1. Would you recommend my film to a friend? Hollywood studios make this the first question on the forms they use for test screenings. They score a movie based on the percentage of people who say definitely. When they get over 80% they generally stop tinkering with the cut. 2. Keep it short! – well, did you? If you think your film is short enough, that’s interesting. The only opinion that counts is that of your audience. I don’t think a film can be great if it feels too long or drags. Consider making your script shorter. It seems natural and strangely unavoidable for beginners to make things too long or at least longer than they need be. This is a beginner’s mistake right up there with bad audio. I still wrestle with the tendency to make things too long. 3. Nothing happened, no surprises – What were you thinking? but not much ever happened and there were no surprises in the plot”. While you’re working on your next script, you could keep a copy of the evaluation form handy to refer to. It might just help you craft a better script and focus on how your audience will see your film. Complete evaluation form and two per page format. It’s fast and easy to complete in a matter minutes. One page and two per page formats. You could tell your screening audience to use the back if they have a lot to say. It’s a four point schedule, the audience can’t simple choose the middle of a scale (as they could with a five point scale). This is a well known survey technique. The form contains a “Don’t Know” check box. So rather than forcing a viewer to check off a box on something they know nothing about, they can select “Don’t Know“. Comments are often the most valuable things on any evaluation form although comments can’t be numerically tabulated. There are 16 areas on this form where the viewer can write a comment. The form asks the audience if they are a Filmmaker (Yes/No). This is useful when considering responses to things like Camera Work etc. If someone is not a filmmaker, their opinion may not be that well informed. 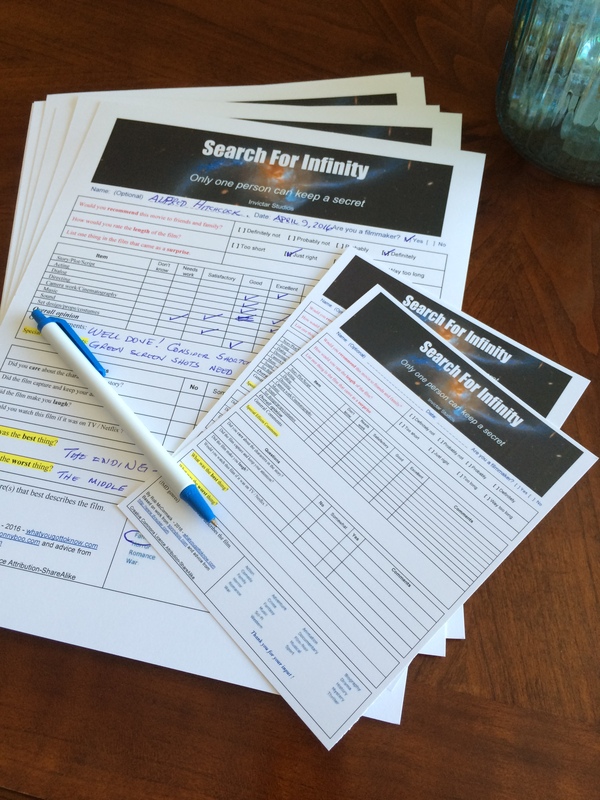 I would suggest if you had a sizable audience, to put the completed forms into two piles – one pile for “Filmmaker Yes“, and one for “Filmmaker N0” and read the non-filmmakers first. The form is easily customizable. Add your logo, image from film, and anything else you want to change. It’s nice to strive for a film to be “first class” in every way you can afford, including the impression the evaluation form makes on the audience. You can choose from Google Doc, Micro$oft Word, or plain text versions. A combination of items 1 – 9. There are several ways you can provide your screening audience with this evaluation form. 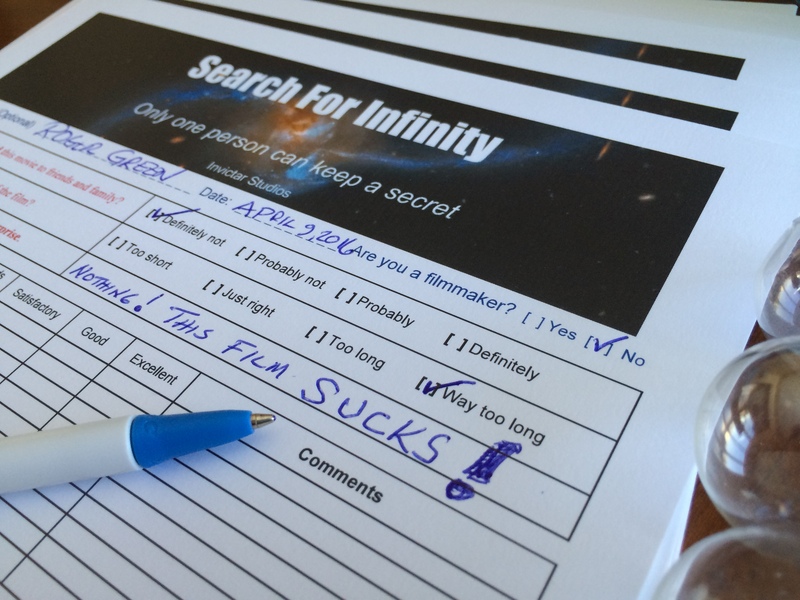 Probably the best way is to have printed forms at the time of the screening. Be sure to bring enough pencils. TIP: you can choose two per page or a single page layout. Consider printing in color and on quality card stock paper. Email a link or attach the Micro$oft Word file. This could be completed shortly after the screening and emailed back to you as an attachment. Email them a plain text version of the form. They can reply to your email and type in their feedback in text format. In a later post on WhatYouGotToKnow.com, we will show how you can easily set up an online mobile version of the form to collect data which will be stored as a spreadsheet. I hope you’ll find this card useful. We welcome suggestions. Why not post a comment below or a link to your customized version of Quiet On Set ? If you have a Gmail account, you can copy this template and customize it. The evaluation form was originally done as a Google Doc. This version could be sent as an email. How would you rate the length of the film? List one thing in the film that was a surprise. Acting= 4, Bobby was an excellent villain. 1. Did you care about the characters in the story? 2. Did the film capture and keep your attention? 3. Did the film make you laugh? 4. Would you watch this film if it was on TV / Netflix ? Next Next post: Quiet On Set !